Discovery of Writing in Oklahoma, U.S.A. This is a portion of the long petroglyph mural that was discovered just to the South of the Purgatory River in the Oklahoma panhandle. The petroglyph was chalked by professor Weisendanger and his associates from Tulsa University in the 1940s, and then photographed in black and white from a large negative. The only surviving print is in the "No Man's Land Museum" in Goodwell, Oklahoma, pictured at the bottom of this page. This section represents about five feet of a carefully executed narrative, reading from right to left, which runs about 70 feet in total length. Areas of the petroglyph were worn with age and water erosion and were not chalked. But what is enhanced is clear enough to translate, and the results are reproduced here for scrutiny. One of the many curious observations that we have been able to make concerns the arrangement of multiple concentric circles. At first, we did not imagine these as ligatures. The arrangement has been shown to result in meaningful translations when taken as a double-Tsadeh ligature. Some examples of the concentric circle ligatures can be seen in these petroglyphs. 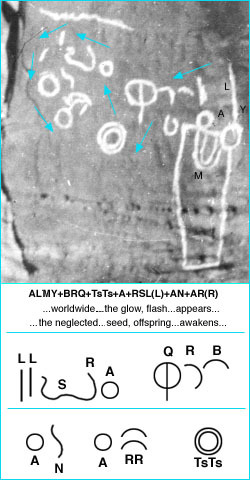 NTN = "give, allow, let..." (A)YL ="...the leader, ram..." L[horizontal]= preposition "to, for, of, from..." AR = "...light..." LN ="...to pray..."
The last LN segment appears to be part of a longer ligature; however, a section of uncarved rock breaks this ligature from the adjoining one while maintaining an illusion of design continuity. 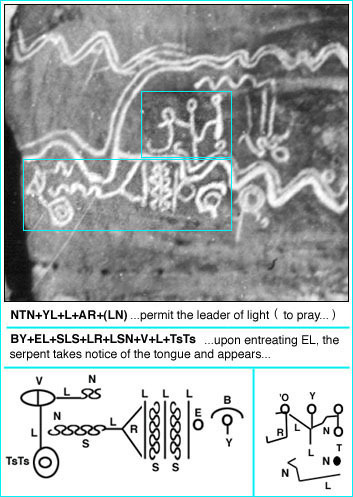 BY = "...entreating, invoking..." AL ="EL (God)" SLS = "...the serpent..." LR ="to be attentive, to take notice..." L[horizontal]= preposition "to, for, of, from..." SN ="tongue, language..." V ="and" TsTs ="to appear, blossom, emerge..."
This could possibly be a reference or prohibition against using the name of the God, "El" or "Yah," in vain because it also allows the "serpent" to be invoked. More translations of the wall could provide some further explanation.